Emails are an important mode of communication. And for many of us managing Emails is also one of the tasks. There are many Email apps available online for both Android and iOS platforms. 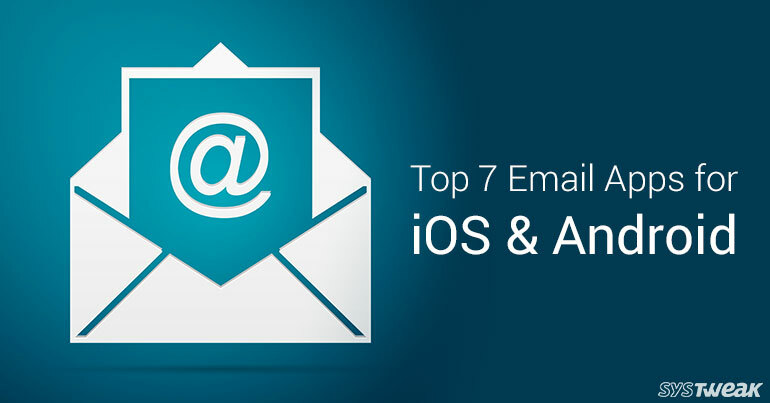 In this article, we are looking at the top 7 Email apps for Android and iOS. Email is an e-mail manager app developed by Edison. It is available for both iOS and Android. It allows you to add multiple email accounts and supports all major platforms including AOL, Outlook, Yahoo, Gmail and iCloud and others. It is the best app which manages all your Email account in a single app. It also has decent interface. Type App Mail also allows you to manage Email accounts and supports various platforms including AOL, Outlook, Yahoo, Gmail and iCloud and others. It also supports push notification feature for all mail types. It works like an alarm for incoming new Emails. Whenever you get a new Email you can snooze it or if you want even your account. It is available for both iOS and Android. Newton Mail is an email manager app developed by CloudMagic. This app also supports various platforms and comes with various features like Sender Profile, Undo Send, Send Later and Snooze. Using Sender profile feature, it will give you information about the sender like LinkedIn, Facebook and Twitter. Gmail is the all-time classic which we all use on our smartphones. Gmail provides a very user-friendly interface. It allows you to perform various task with ease like you can delete a mail by just swiping right and if you want you can undo it again. It consists various features in a single app. Inbox by Gmail is an innovative app developed by Gmail. It is also compatible with both iOS and Android. It only works with your Gmail account but it works with bundles of Emails. Using this you can also pin your Emails to top of your inbox. It also highlights incoming mail and activity in Google+ account. Between all the famous email apps, Blue Mail is one of the famous email apps available on the Google Play. It supports all major platforms including Outlook, Yahoo and Gmail etc. It allows you to manage multiple email accounts on both Android and iOS. It is very user-friendly app and does not take much space of your phone. Like all above apps, myMail also manages all your Email accounts in a single app. It supports all major Email providers like AOL, Outlook, Yahoo, Gmail and iCloud and others. Using this application, you can go to inbox with menu icons. The layout of the app is very simple and nice-looking. We hope that the above-mentioned Emails apps will make your mind clear for selection. Each app has some exceptional feature. It would be great if you share your comment, in the provided section below.